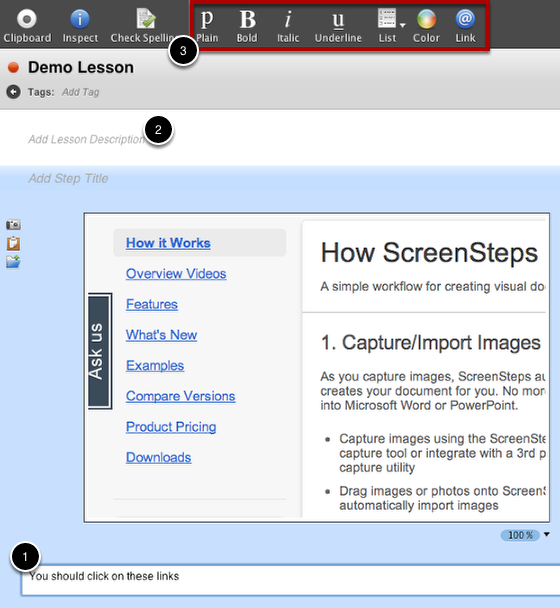 Learn what text editing options are available in ScreenSteps 2. 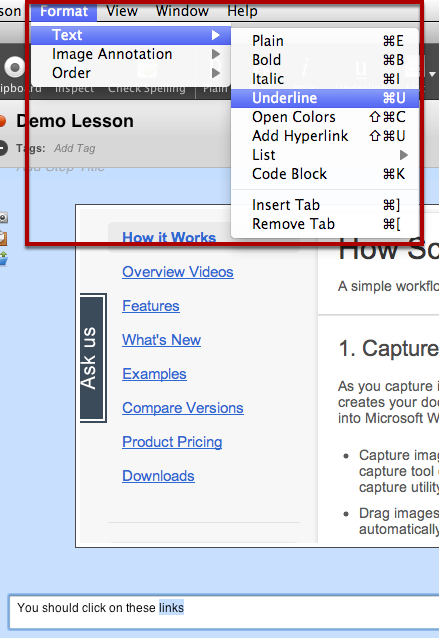 If you open a text field in a lesson for step instructions (1) or lesson description (2) the text editing tools will appear on the toolbar (3). Text editing tools are not available for lesson titles or step titles. The tools are all pretty self-explanatory. Select some text and click on a tool to apply the formatting. Alternatively you can use the Format menu to format text. This menu also displays the shortcut keys for each formatting option. I am having some trouble figuring out how to use the bullet feature. Every time I press Enter in the Step text, the text box closes. @Val - the Enter key will close the text editor. The Return key will add a return character. I'm wondering how to nest an unordered list in an ordered list. @Shunyata - ScreenSteps 2 does not support nested lists. The next major upgrade will allow nested lists though.